love the "announcement?" Congrats you guys! So so happy for y'all! Can't wait to meet little (or tall if she/he takes after daddy) baby gentry! I'm SO UNBELIEVABLY HAPPY FOR YOU!!! Oh my word WHY does this font not get BIGGER??? 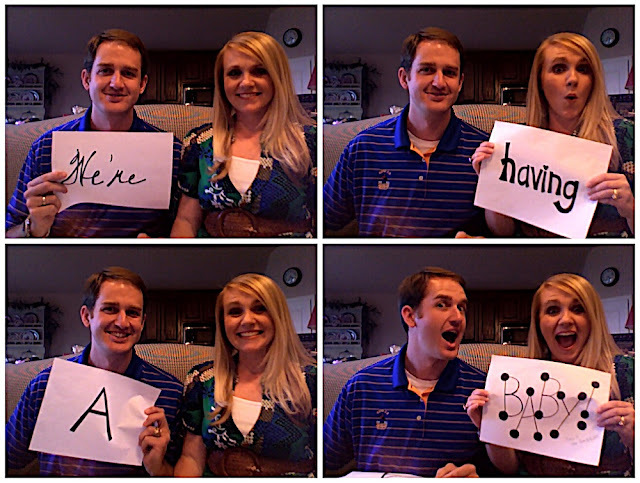 this is EXCELLENT EXCELLENT news, the Dantzlers can't wait to welcome a new baby to the 'hood! I see park playdates in our future! We are so happy for you. Happy news for you two! Congrats! So happy for you!! And I love your handwriting. Congratulations!! You'll be great parents! (And March is a GREAT month to have a baby...our first was born in March). What awesome news! I am sooooo very excited for you! Babies are the best. I am so behind in the blog world and decided to try and catch up on some today. As I scrolled through my list, I saw 5 new entries from you and thought, "I need to go see if any of those are a pregnancy announcement." Seriously. I have been praying for this blessing for you guys and am thrilled for you!